Welcome to Medcie medical system! Welcome to Medcie medical system and welcome to visit our website. We mainly deal with medical instruments and disposable products, we do our best to serve customers with very competitive prices and high quality products. Prompt delivery and satisfactory service are guaranteed by our professional staff. We have been putting emphasis on quality development and appearance enhancement to meet the market demands. is our registered brand. And customer's brand, logo, design and specification are welcome. 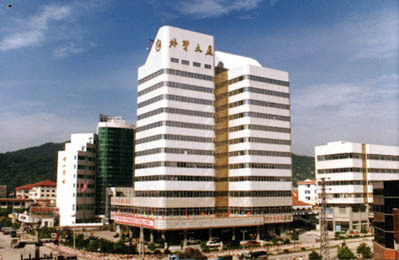 Our head office - China Ningbo Cixi Import and Export Corporation, founded in 1973, is a comprehensive enterprise with import and export trade as its main business. It possesses more than 20 trading subsidiary companies, one industrial zone occupying 250mu (168,000 m2), and more than 20 manufacturing factories. In 2006, its Exp. amount ranked number 1 in Ningbo. Our main products are bearing, home appliance, medical instruments, garments, hardware mould, suitcase bags, shoes and hats, bath ware and bamboo ware. Our company set up domestic branches in Shanghai, Ningbo, Hangzhou and Shenzhen, and situated abroad branches in U.S., Germany, Hong Kong, Russia, Poland, Japan, Chile, Romania. Our company has more than 30 years experience of international trade, abundant economic power and steady industry base. The Ministry of China Business Affairs has commended it via media for its outstanding achievements for several times. It has the examing and approving right to dispatch persons abroad temporarily and invite persons working on economy and trade from abroad. And it also has the right to be agent in international cargo freight and the right to undertake projects abroad, manage labor cooperation. Within our company ISO9001, ISO14001 is extended fully.